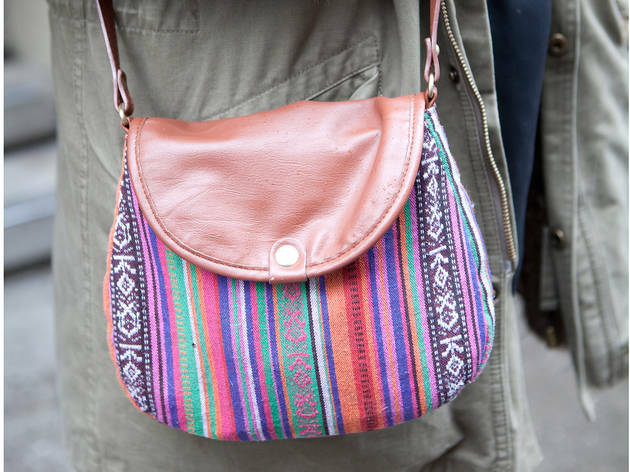 Amy Levin, CollegeFashionista’s founder and creative director, takes us scouting for stylish undergraduates at NYU, Parsons and FIT. 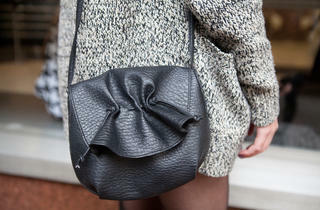 Photograph: Jessica LinDuring her senior year at Indiana University, Amy Levin started a blog documenting student fashion on campus. 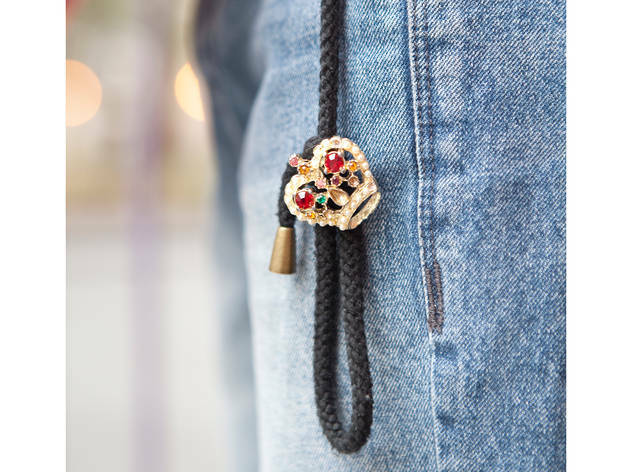 &ldquo;I noticed the influence street style was having on the fashion industry and realized that no one was really focusing on the college demographic,&rdquo; she says. 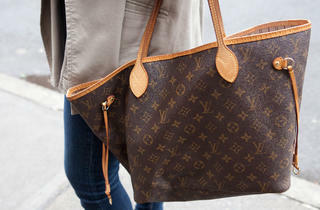 In August 2009, Levin launched her full-blown site CollegeFashionista (collegefashionista.com), devoted to covering undergraduate style at five different schools. 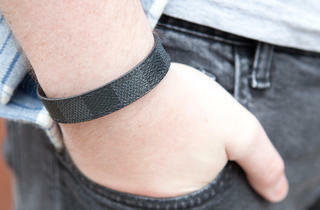 Its reach has since grown to more than 300 campuses, prompting a relaunch this month. 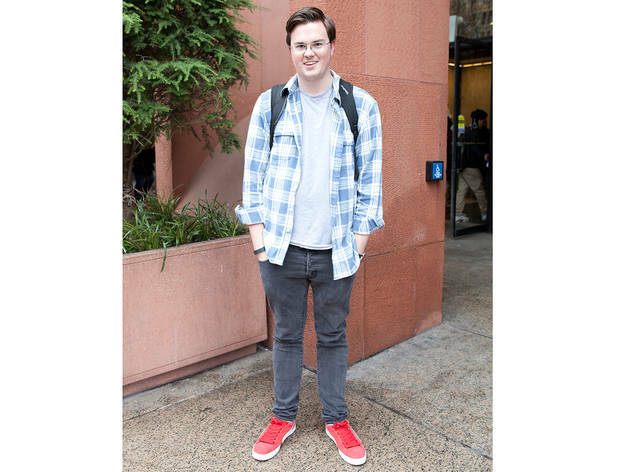 &ldquo;College is the first time a lot of people are away from home, and you&rsquo;re really experimenting with who you are as a person,&rdquo; explains Levin. 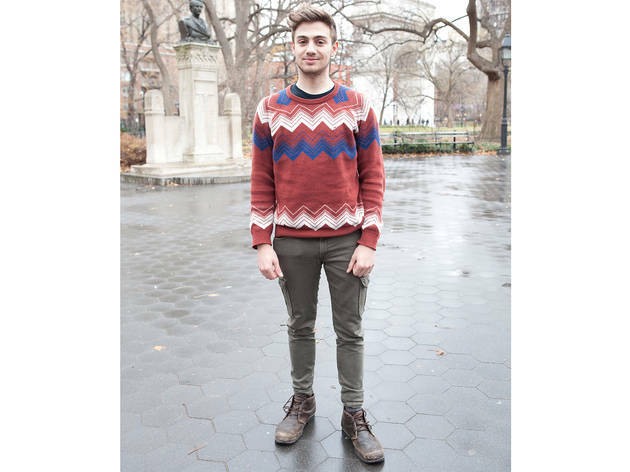 &ldquo;That naturally comes out through what you&rsquo;re wearing.&rdquo; To see just how trendsetting coeds can be, we had Levin lead us through New York University, Parsons the New School for Design and the Fashion Institute of Technology on a rainy December afternoon. 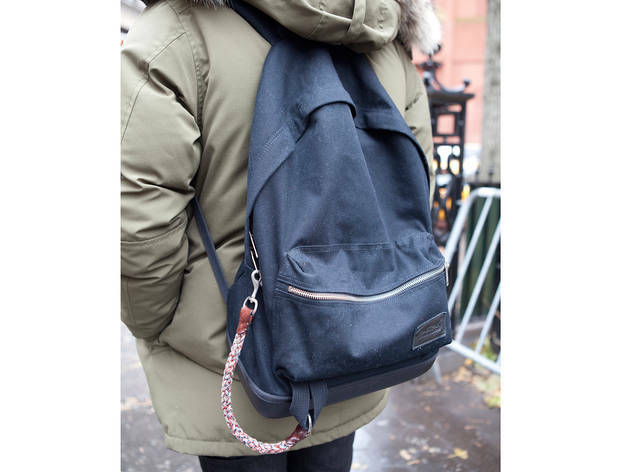 Neither finals nor inclement weather could stop the students we encountered&mdash;clad in fur-trimmed jackets and designer schoolbags&mdash;from looking their best. 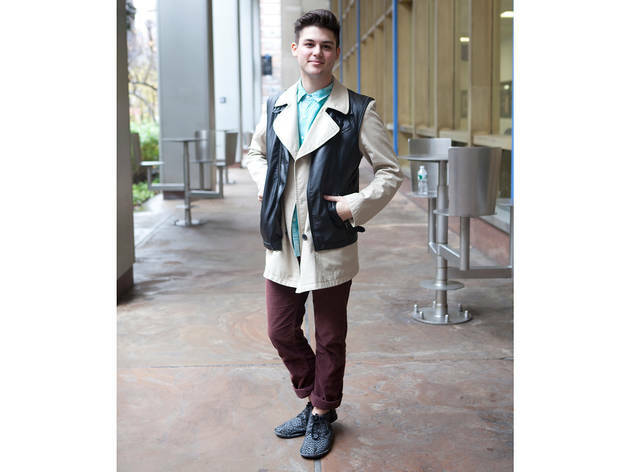 Photograph: Jessica LinPedro Azevedo, 24, film major at Miami Dade College; Miami, Florida&ldquo;I love when guys wear fur,&rdquo; says Levin, referring to the trim on Azevedo&rsquo;s coat from Zara (locations throughout the city; visit zara.com). 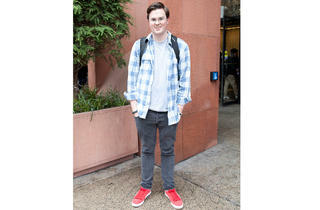 The out-of-towner, who was visiting a friend at NYU, layers it over a plaid button-up shirt and tee from Polo Ralph Lauren (ralphlauren.com), and classic Levi&rsquo;s jeans (locations throughout the city; visit us.levi.com). 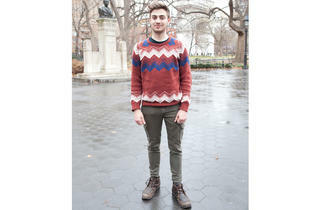 Photograph: Jessica LinCole Norum, 18, film major at New York University, West VillageNorum&rsquo;s Koto crewneck sweater, purchased on sale at Urban Outfitters (locations throughout the city; visit urbanoutfitters.com), initially caught Levin&rsquo;s eye. 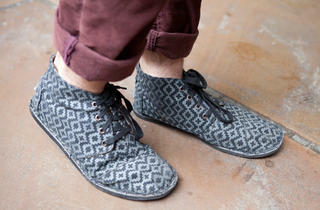 &ldquo;I always love when I see a guy who is bold enough to wear a print,&rdquo; she explains. 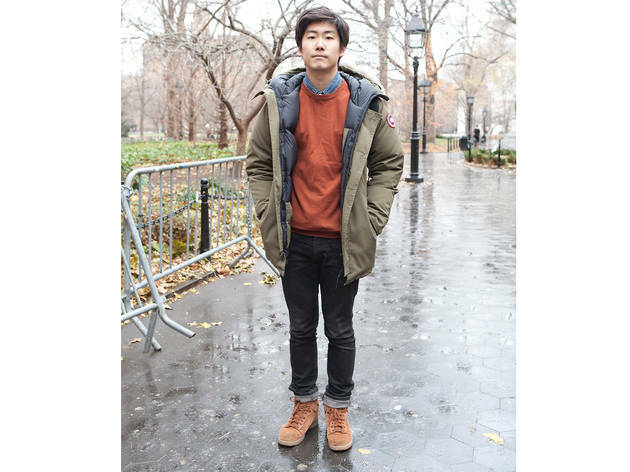 &ldquo;Then when we got closer, I noticed his hair&mdash;that style is really in for college guys. 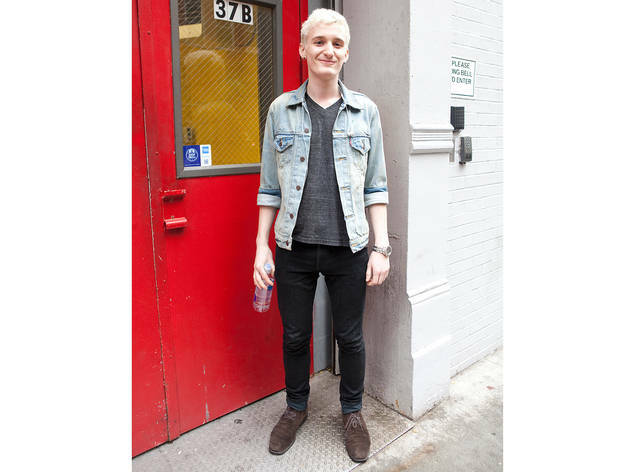 It&rsquo;s poofier on the top and sort of messy when they run their hands through it.&rdquo; A graphic tee and 7 For All Mankind skinny cargo pants discovered at East Village Thrift Shop (186 Second Ave between 11th and 12th Sts, 212-375-8585) complete his casual ensemble. 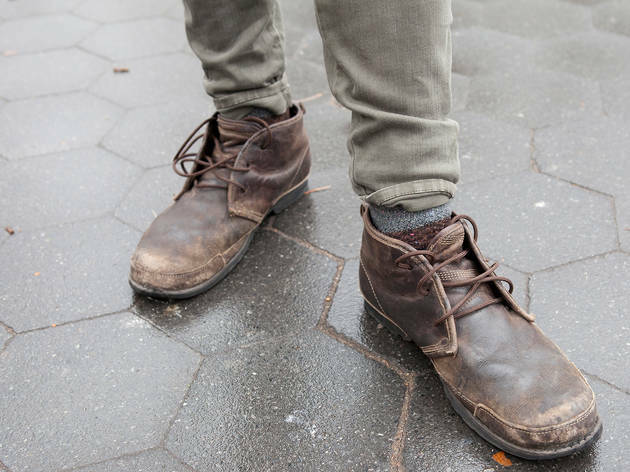 Photograph: Jessica LinCole Norum, 18, film major at New York University, West VillageWhen paired with marled camping socks, these scuffed Timberland desert boots provide a cozy, artfully disheveled look. 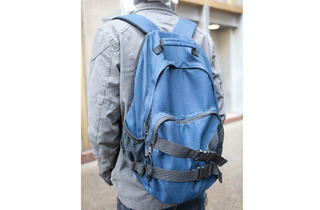 Photograph: Jessica LinTaehoon Lee, 24, economics major at New York University, ChinatownLee clipped a Folk (folkclothing.com) braided keychain onto his Eastpak (eastpak.com) backpack&mdash;the product of a collaboration with menswear designer Kris van Assche (krisvanassche.com)&mdash;to give the basic canvas bag some fashionable flair. Photograph: Jessica LinTaehoon Lee, 24, economics major at New York University, ChinatownThese suede Dunk high-top sneakers are part of a collaboration between French label A.P.C. and Nike (nike.com). 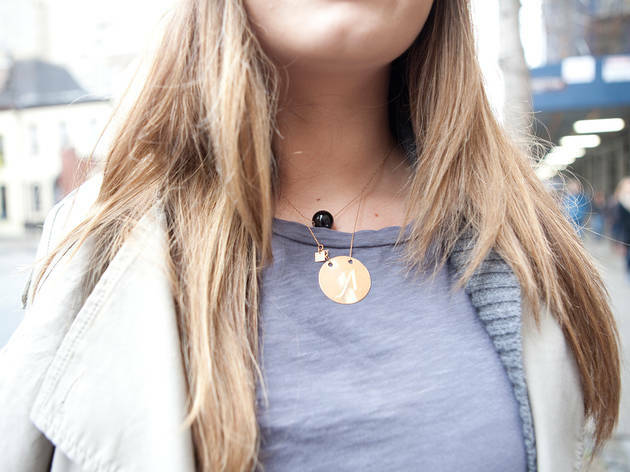 Photograph: Jessica LinLydia Karagianni, 19; economics, philosophy and political science triple major at New York University; GramercyKaragianni received both of these necklaces as gifts from her parents. 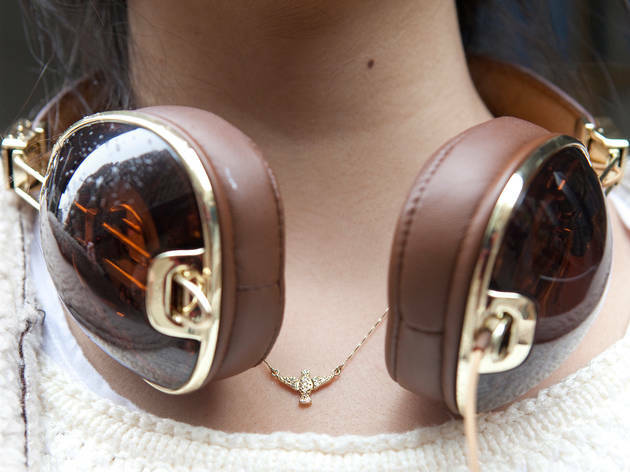 The monogram disc features a lambda, the Greek letter for her first initial. 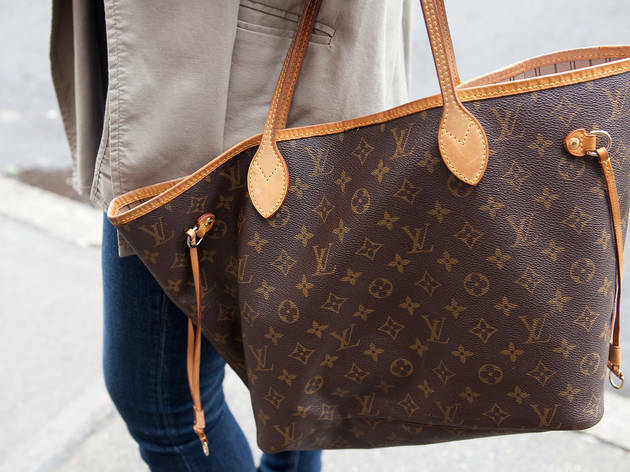 Photograph: Jessica LinLydia Karagianni, 19; economics, philosophy and political science triple major at New York University; GramercyA Louis Vuitton (1 E 57th St at Fifth Ave; 212-758-8877, louisvuitton.com) logo tote makes for a seriously chic schoolbag. 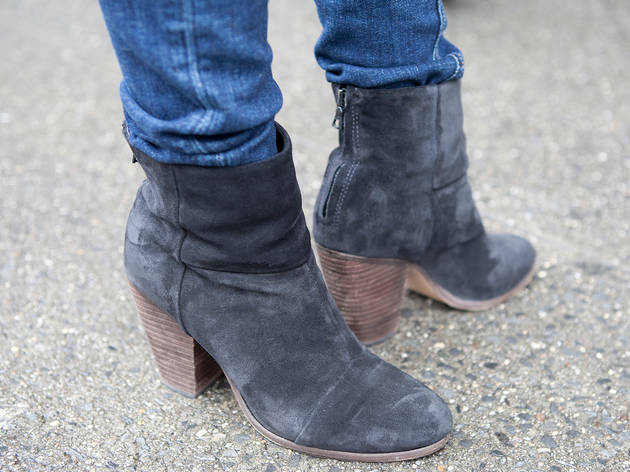 Photograph: Jessica LinLydia Karagianni, 19; economics, philosophy and political science triple major at New York University; GramercyThe stacked heels on these Rag &amp; Bone suede booties ensure commuting to class is a comfortable endeavor. 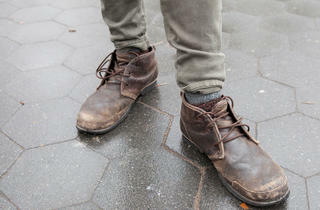 Photograph: Jessica LinIan Hundiak, 21, English major at New York University and sneaker vlogger (youtube.com/user/sirsneaker), West VillageLevin appreciates Hundiak&rsquo;s bold suede Puma sneakers (521 Broadway between Broome and Spring Sts, 212-334-7861 &bull; 33 Union Square West between 16th and 17th Sts, 212-206-7761 &bull; puma.com), which provide a visually interesting twist to his staple guy pieces: jeans and a tee from H&amp;M (locations throughout the city; visit hm.com), and a plaid button-up shirt from Old Navy (locations throughout the city; visit oldnavy.com). 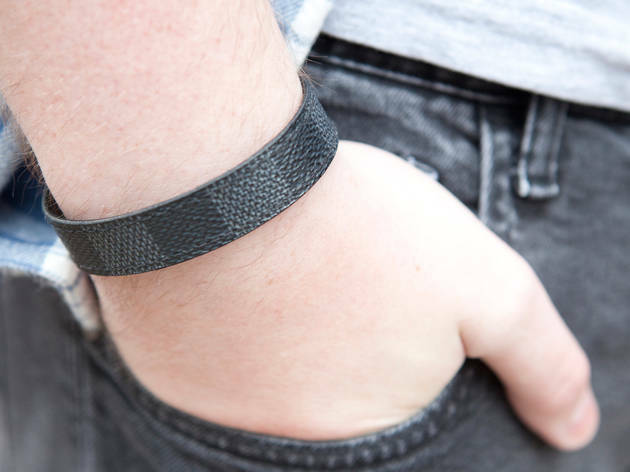 Photograph: Jessica LinIan Hundiak, 21, English major at New York University and sneaker vlogger (youtube.com/user/sirsneaker), West VillageThis Louis Vuitton bracelet is an unexpected high-end accessory. 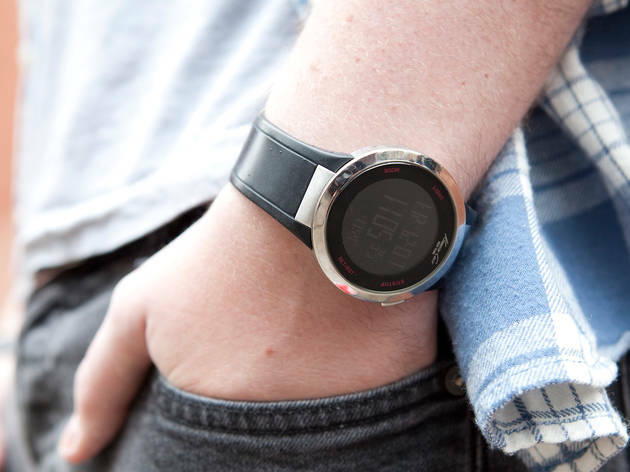 Photograph: Jessica LinIan Hundiak, 21, English major at New York University and sneaker vlogger (youtube.com/user/sirsneaker), West VillageA digital watch from Kenneth Cole (locations throughout the city; visit kennethcole.com) helps Hundiak stay punctual while looking sleek. 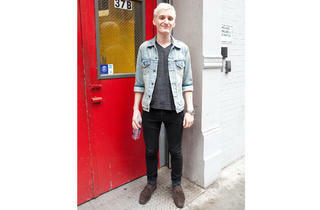 Photograph: Jessica LinKerrin Smith, 20; economics, social entrepreneurship and fashion major at NYU Gallatin School of Individualized Study, and fashion blogger (catid.net); West VillageComfort was key when Smith put together this menswear-inspired outfit, featuring slouchy Madewell jeans (115 Fifth Ave between at 19th St, 212-228-5172 &bull; 486 Broadway at Broome St, 212-226-6954 &bull; madewell.com), a men&rsquo;s Marc by Marc Jacobs (382 Bleecker St at Perry St; 212-929 0304, marcjacobs.com) three-quarter-length tee and a Joie (1196 Madison Ave between 87th and 88th Sts, 212-837-2220 &bull; 114 Wooster St between Prince and Spring Sts, 646-284-9081 &bull; joie.com) leather jacket. 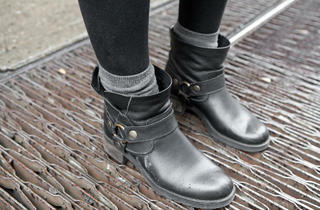 &ldquo;Boyfriend jeans are one of those trends that&rsquo;s hard to pull off, but she&rsquo;s the perfect body type for it,&rdquo; says Levin. 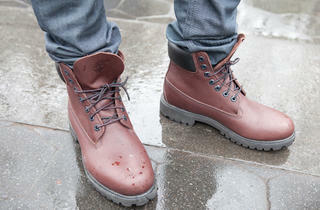 &ldquo;They look great on her. 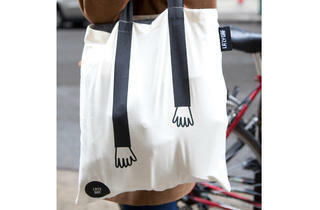 She just has that effortlessly cool look.&rdquo; A Marc by Marc Jacobs laptop case doubles as a clutch. 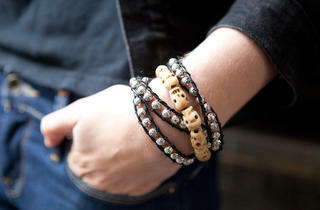 Photograph: Jessica LinKerrin Smith, 20; economics, social entrepreneurship and fashion major at NYU Gallatin School of Individualized Study, and fashion blogger (catid.net); West VillageSmith piles vintage bracelets atop a David Yurman (712 Madison Ave at 63rd St; 212-752-4255, davidyurman.com) bangle. Her customized ring from Boston jewelry boutique Pageo (pageo.com) bears an interior inscription and was a high school graduation gift. 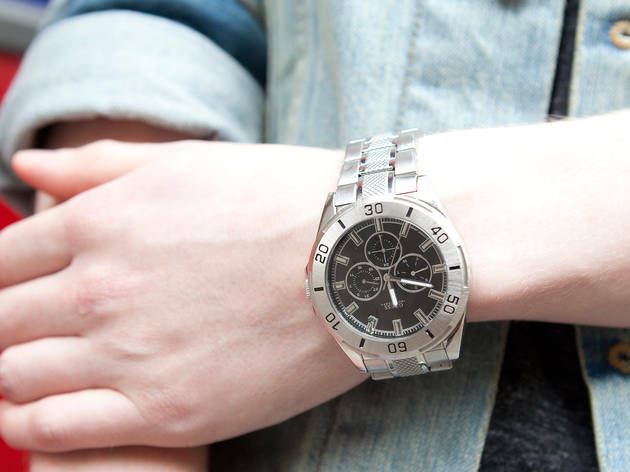 A Rolex watch adorns her opposite wrist. 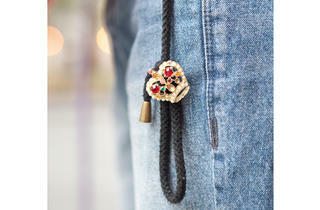 Photograph: Jessica LinKerrin Smith, 20; economics, social entrepreneurship and fashion major at NYU Gallatin School of Individualized Study, and fashion blogger (catid.net); West VillageSmith calls this bejeweled crown, found in her mother&rsquo;s jewelry box, her &ldquo;princess pin.&rdquo; She attaches it to the drawstring of her leather jacket for a whimsical touch. 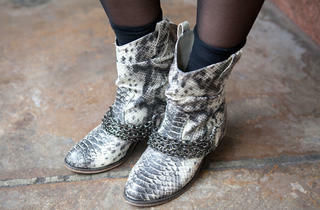 Photograph: Jessica LinKerrin Smith, 20; economics, social entrepreneurship and fashion major at NYU Gallatin School of Individualized Study, and fashion blogger (catid.net); West Village&ldquo;These are the most comfortable shoes I own,&rdquo; effuses Smith of her Stubbs &amp; Wootton (stubbsandwootton.com) leopard-print slippers. 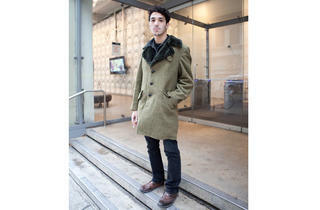 Photograph: Jessica LinNoe Paparella, 19, fine arts major at Parsons the New School for Design, Union Square&ldquo;I&rsquo;m a fan of the military trend and the length of this jacket is great,&rdquo; says Levin, referring to France transplant Paparella&rsquo;s army green coat from Parisian boutique Shine. &ldquo;It&rsquo;s the kind of thing you can wear with everything, and as a college student you want pieces that are versatile.&rdquo; Paparella throws the jacket over Uniqlo (666 Fifth Ave at 53rd St &bull; 31 W 34th St between Fifth and Sixth Aves &bull; 546 Broadway between Prince and Spring Sts &bull; 877-486-4756, uniqlo.com) leggings and a Forever 21 (locations throughout the city; visit forever21.com) tank. 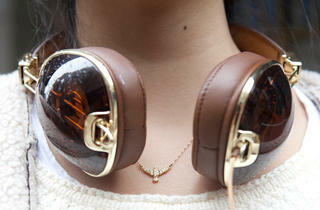 Her WeSC x Dim Mak headphones act as a vibrant accessory. 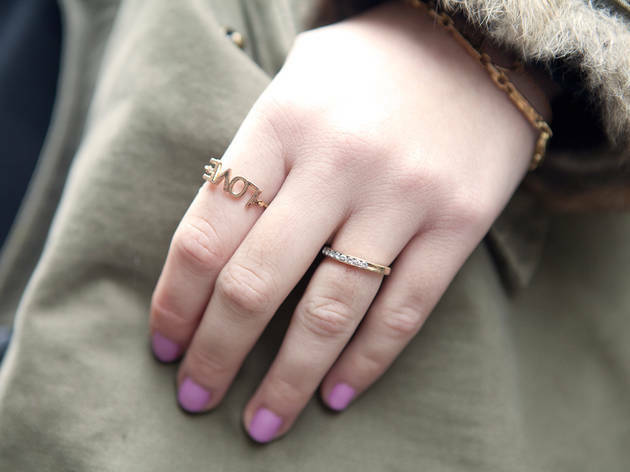 Photograph: Jessica LinNoe Paparella, 19, fine arts major at Parsons the New School for Design, Union SquareBoth of these delicate rings were made by Paparella&rsquo;s grandfather. 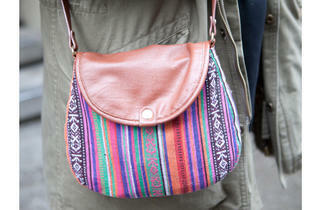 Photograph: Jessica LinNoe Paparella, 19, fine arts major at Parsons the New School for Design, Union SquareAn ethnic-print bag from Parisian store Andre (andre.fr) provides a dash of Bohemian pizzazz. 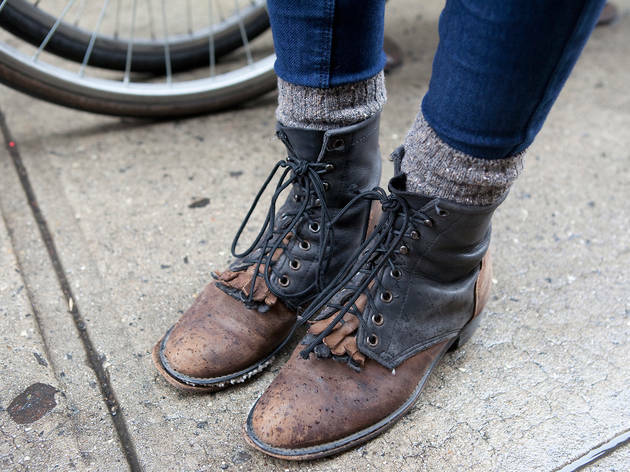 Photograph: Jessica LinNoe Paparella, 19, fine arts major at Parsons the New School for Design, Union SquareThick socks scored at a Chinatown shop add extra padding to Paparella&rsquo;s Shine motorcycle boots. 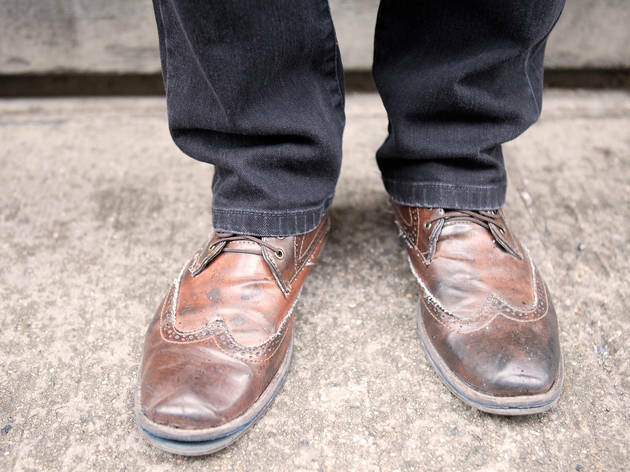 Photograph: Jessica LinJohnny Taranto, 21, fine arts major at Parsons the New School for Design; Crown Heights, BrooklynCognac-colored wing tips from H&amp;M are an easy and affordable way to look dapper. 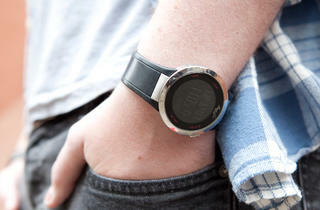 Photograph: Jessica LinAven Helford, 19; fashion design major at Parsons the New School for Design; Flatiron DistrictA belt from Target (locations throughout the city; visit target.com) helps keep Helford&rsquo;s pants from Active (activerideshop.com) in place. 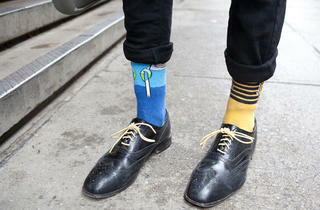 Photograph: Jessica LinAven Helford, 19; fashion design major at Parsons the New School for Design; Flatiron DistrictMismatched Toddland (toddland.com) socks are a cheeky contrast to spiffy Florsheim (444 Madison Ave at 49th St; 212-752-8017, florsheim.com) wingtips. 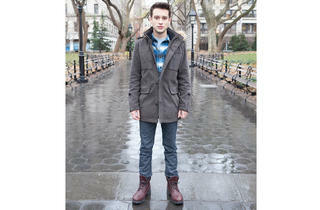 Photograph: Jessica LinNoelle Campbell, 22, communication design major at Parsons the New School for Design and history major at Eugene Lang College the New School for Liberal Arts, Union Square&ldquo;Oversized coats are a big trend this season,&rdquo; says Levin, motioning towards Campbell&rsquo;s Asos (asos.com) fur-trimmed style. &ldquo;I like that it&rsquo;s a large jacket with not much of a shape.&rdquo; To emphasize her petite frame, Campbell pairs it with skinny jeans from Zara. 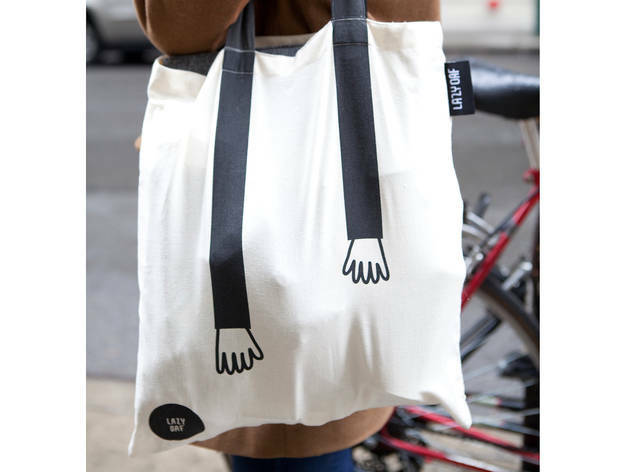 Photograph: Jessica LinNoelle Campbell, 22, communication design major at Parsons the New School for Design and history major at Eugene Lang College the New School for Liberal Arts, Union SquareCampbell gets a hand schlepping her stuff with this fanciful Lazy Oaf (lazyoaf.co.uk) tote. 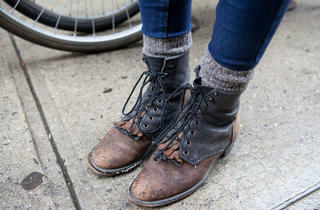 Photograph: Jessica LinNoelle Campbell, 22, communication design major at Parsons the New School for Design and history major at Eugene Lang College the New School for Liberal Arts, Union SquareCampbell discovered these brogue boots at secondhand store No Relation Vintage (204 First Ave between 12th and 13th Sts, norelationvintage.com). 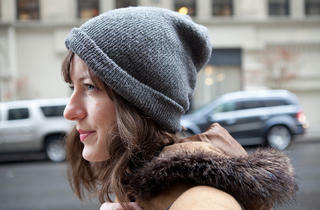 Photograph: Jessica LinNoelle Campbell, 22, communication design major at Parsons the New School for Design and history major at Eugene Lang College the New School for Liberal Arts, Union SquareEven a simple knit hat from Duane Reade (locations throughout the city; visit duanereade.com) can look stylish when paired with a fur-trimmed camel coat. 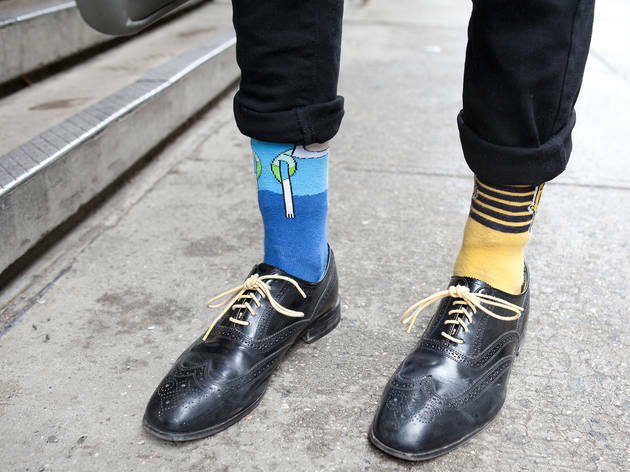 Photograph: Jessica LinRosie Ko, 20, design management major at Parsons the New School for Design, East Village&ldquo;Something I always see [on campus] is shorts with tights,&rdquo; says Levin. &ldquo;It&rsquo;s one of those trends that you probably outgrow once you graduate, but college students love it and I see it across the board.&rdquo; Ko winterizes a pair of the Ragged Priest (theraggedpriest.com) shorts in exactly this manner, and wears them with a J.Crew (locations throughout the city; visit jcrew.com) plaid shirt and a peacoat from Korean brand Andew. A yellow-trimmed umbrella from Beacon&rsquo;s Closet (92 Fifth Ave at Warren St, Park Slope, Brooklyn; 718-230-1630 &bull; 88 North 11th St between Berry St and Wythe Ave, Williamsburg, Brooklyn; 718-486-0816 &bull; 10 W 13th St between Fifth and Sixth Aves, 917-261-4863 &bull; beaconscloset.com) adds a cheerful pop of color on dreary days. 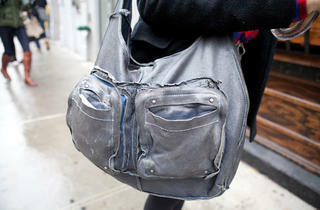 Photograph: Jessica LinRosie Ko, 20, design management major at Parsons the New School for Design, East VillageKo uses a roomy Olivia Harris (shopoliviaharris.com) satchel in lieu of a traditional backpack. 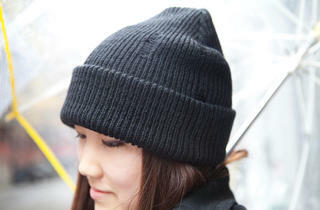 Photograph: Jessica LinRosie Ko, 20, design management major at Parsons the New School for Design, East VillageA ribbed knit cap from LF (149 Spring St between West Broadway and Wooster St, 212-966-5889 &bull; 150 Fifth Ave between 19th and 20th Sts, 212-645-1334 &bull; lfstores.com) keeps Ko warm while further shielding her hair from the rain. 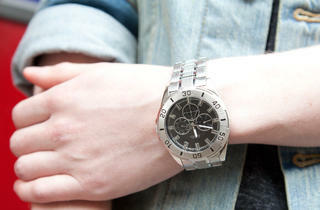 Photograph: Jessica LinValentyn Fedak, 22, illustration major at Parsons the New School for Design, East VillageFedak&rsquo;s stainless-steel watch from Guess (locations throughout the city; visit guess.com) is just as pared down as the rest of his look. 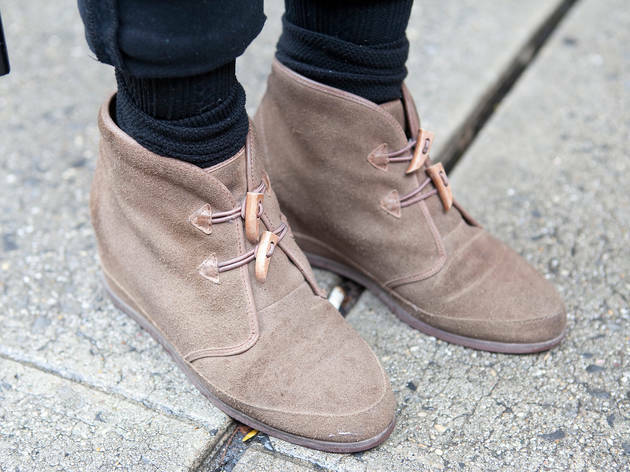 Photograph: Jessica LinValentyn Fedak, 22, illustration major at Parsons the New School for Design, East VillageSuede desert boots from Calvin Klein (654 Madison Ave between 60th and 61st Sts; 212-292-9000, calvinklein.com) add texture and polish to an otherwise basic outfit. 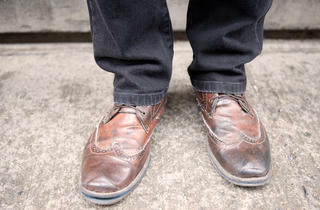 Photograph: Jessica LinAlex Benjamin, 20, illustration major at the Fashion Institute of Technology, Chelsea&ldquo;I love when guys cuff their jeans,&rdquo; says Levin, who was initially drawn to the way Benjamin folded up his Levi&rsquo;s pants from Buffalo Exchange (locations throughout the city; visit buffaloexchange.com). &ldquo;I also liked learning about where his stuff came from because it&rsquo;s all budget-friendly, but he put it together well.&rdquo; He layers a jacket and zip-up sweatshirt from Target over a T-shirt that belongs to his father, and lets the brim of his DQM (7 E 3rd St between Bowery and Second Ave; 212-505-7551, dqmnewyork.com) hat and colorful earbuds from T.J.Maxx (locations throughout the city; visit tjmaxx.com) peek out from under his garb. 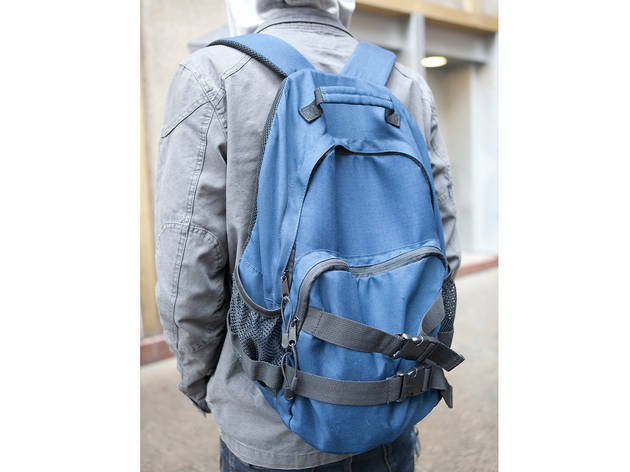 Photograph: Jessica LinAlex Benjamin, 20, illustration major at the Fashion Institute of Technology, ChelseaBenjamin purchased his backpack at H&amp;M.
Photograph: Jessica LinAlex Benjamin, 20, illustration major at the Fashion Institute of Technology, ChelseaIndigo suede Vans sneakers blend seamlessly with denim, and visually elongate the legs. 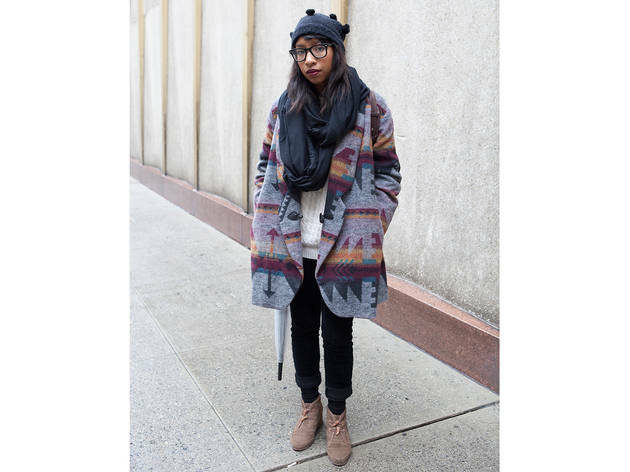 Photograph: Jessica LinStephanie Griffin, 22, public relations major at the University of New Mexico; Bushwick, BrooklynLevin fell hard for Griffin&rsquo;s ethnic-print Asos coat. 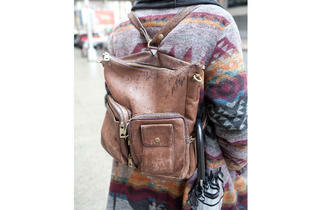 &ldquo;I&rsquo;m obsessed with Pendleton (pendleton-usa.com) and that jacket reminded me of [the brand],&rdquo; she explains. 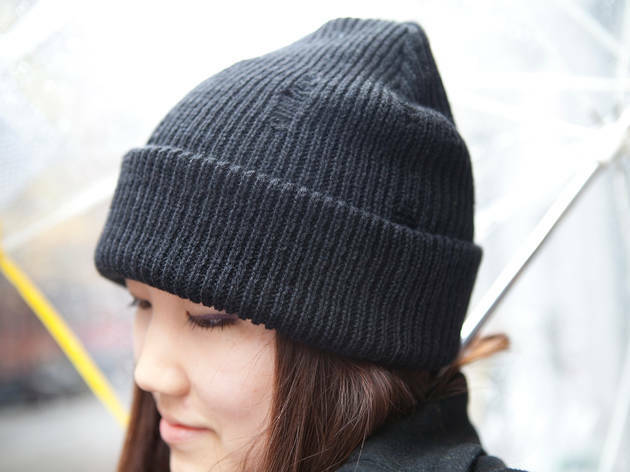 &ldquo;It&rsquo;s just such a cool statement piece.&rdquo; The transfer student, who is currently taking online classes at her old school, purchased her vintage sweater, &rsquo;90s pom-pom hat and J. 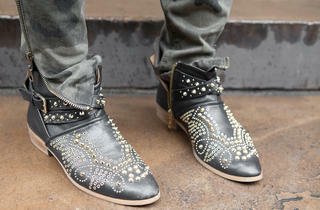 Brand jeans at Beacon&rsquo;s Closet in Park Slope, where she works. 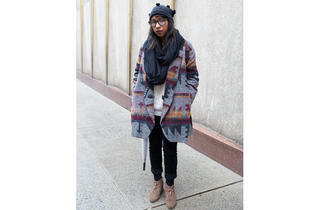 She accessorizes with an American Apparel (locations throughout the city; visit americanapparel.net) infinity scarf and Ray-Ban (ray-ban.com) glasses. 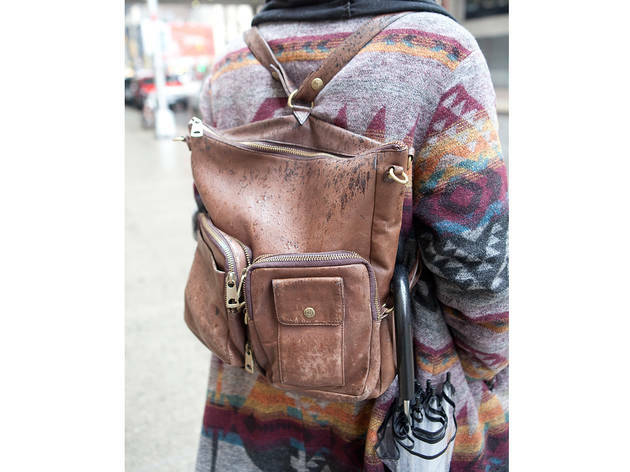 Photograph: Jessica LinStephanie Griffin, 22, public relations major at the University of New Mexico; Bushwick, BrooklynA Marc Jacobs leather backpack serves as a luxurious schoolbag. 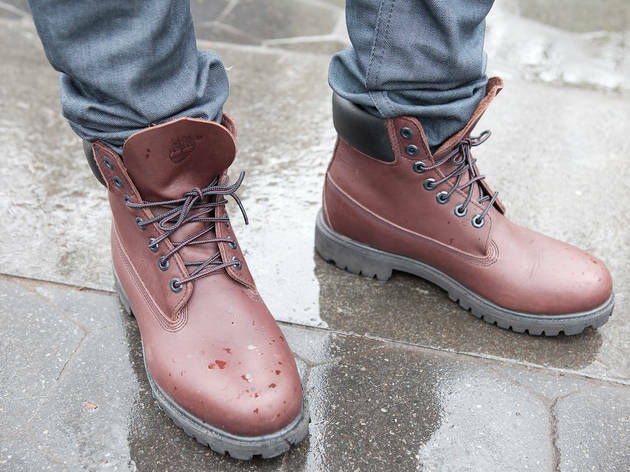 Photograph: Jessica LinStephanie Griffin, 22, public relations major at the University of New Mexico; Bushwick, BrooklynGriffin will get plenty of mileage out of these neutral-hued 80%20 (8020nyc.com) booties. 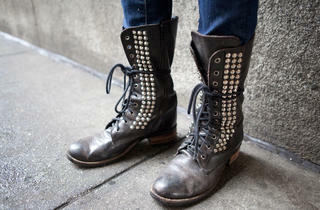 Photograph: Jessica LinKassidy Reynolds, 19, fashion design major at the Fashion Institute of Technology, Chelsea&ldquo;She&rsquo;s got that rocker chick thing going on,&rdquo; says Levin of Reynolds&rsquo;s heavily studded look. &ldquo;For instance, her T-shirt is legit&mdash;it&rsquo;s not even a vintage one.&rdquo; Indeed, Reynolds scored her Van Halen tee at the rock band&rsquo;s concert, and wears it with an Andrew Charles (andrewcharles.com) embellished denim jacket, Lucky Brand (locations throughout the city; visit luckybrand.com) jeans and a Free People (locations throughout the city; visit freepeople.com) chain-link purse. M.A.C. (locations throughout the city; visit maccosmetics.com) Lipglass tinted lip gloss in Cult of Cherry amps up her edgy vibe. 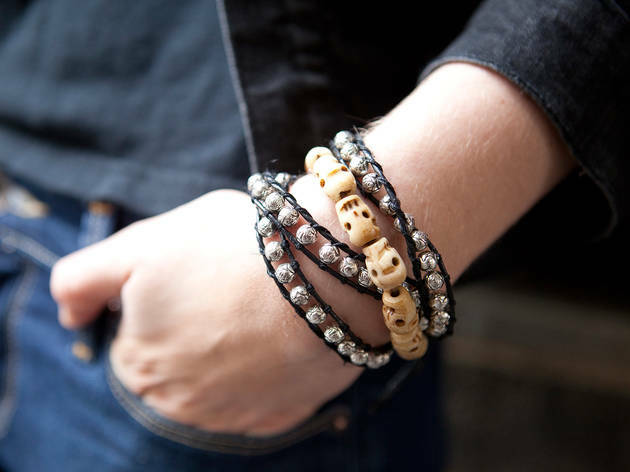 Photograph: Jessica LinKassidy Reynolds, 19, fashion design major at the Fashion Institute of Technology, ChelseaReynolds intertwines a Lucky Brand beaded wrap bracelet with a wood-skull style she discovered at the Hell&rsquo;s Kitchen Flea Market (W 39th St between Ninth and Tenth Aves; 212-243-5343, hellskitchenfleamarket.com). 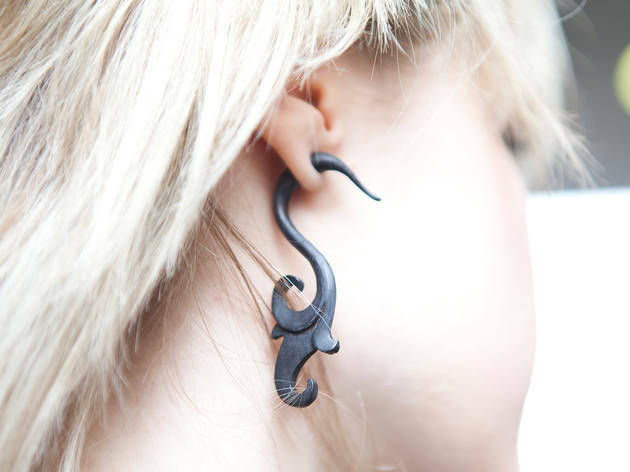 Photograph: Jessica LinKassidy Reynolds, 19, fashion design major at the Fashion Institute of Technology, ChelseaThese organic-wood earrings are by Coco Loco (coconutjewelry.com). 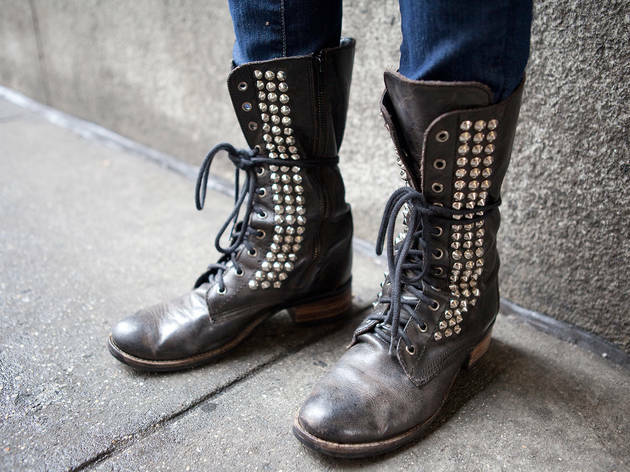 Photograph: Jessica LinKassidy Reynolds, 19, fashion design major at the Fashion Institute of Technology, ChelseaCalf-length studded Steve Madden (locations throughout the city; visit stevemadden.com) boots transmit tough-girl signals. 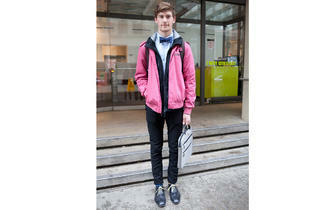 Photograph: Jessica LinPatrick Ching, 18, fashion merchandising management major at the Fashion Institute of Technology, Chelsea&ldquo;FIT did a whole exhibit on the evolution of ivy style,&rdquo; recalls Levin, who noticed Ching&rsquo;s Amongst Friends (amongstfriendsnyc.com) varsity jacket from across the street. &ldquo;It&rsquo;s obvious from walking around campus that this collegiate style is still very on trend, just with a twist.&rdquo; Ching modernizes his varsity letterman look with a V-neck tee from Gap (locations throughout the city; visit gap.com), 7 For All Mankind whiskered jeans and a James Avery (jamesavery.com) cross necklace. 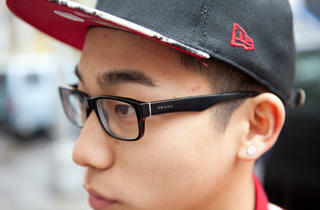 Photograph: Jessica LinPatrick Ching, 18, fashion merchandising management major at the Fashion Institute of Technology, ChelseaChing supports the New York Yankees with a New Era (9 E 4th St between Broadway and Lafayette St; 212-533-2277, neweracap.com) hat, featuring the same color scheme as the rest of his ensemble. 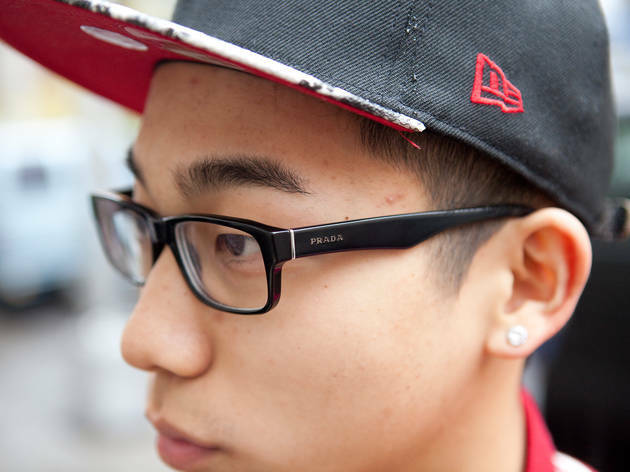 He bought his Prada (prada.com) glasses in Texas and found the cubic zirconia stud earring at Claire&rsquo;s offshoot Icing (icing.com). 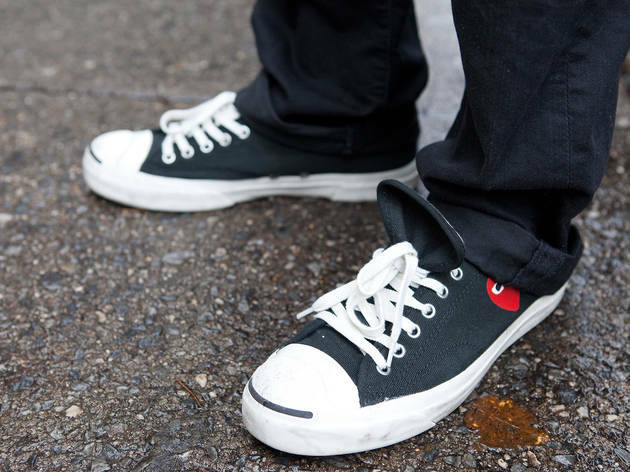 Photograph: Jessica LinPatrick Ching, 18, fashion merchandising management major at the Fashion Institute of Technology, ChelseaThese heart-adorned sneakers are from a collaborative collection between Comme des Gar&ccedil;ons Play and Converse (560 Broadway at Prince St; 212-966-1099, converse.com). 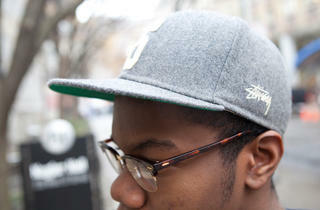 Photograph: Jessica LinChimaobi Anakwenze, 18, advertising and marketing communication major at the Fashion Institute of Technology, ChelseaAnakwenze was walking down the street with Ching when we spotted them, and Levin was struck by their corresponding baseball hats, tennis shoes and glasses. 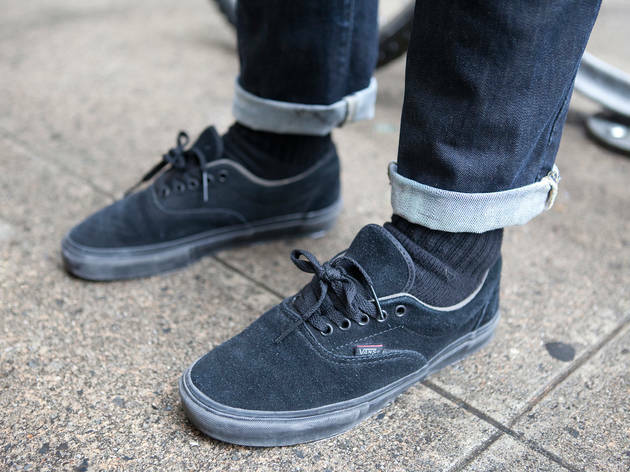 &ldquo;Their outfits had a lot of similarities, which is typically common for best girlfriends, so it was cool to see guy friends matching in a sense,&rdquo; she reflects. 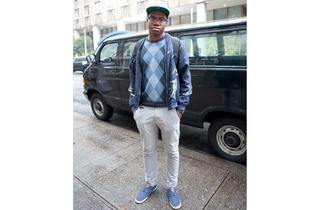 Anakwenze differentiates himself with a gifted vintage jacket, a Dockers (us.dockers.com) argyle sweater and Asos checkered pants. 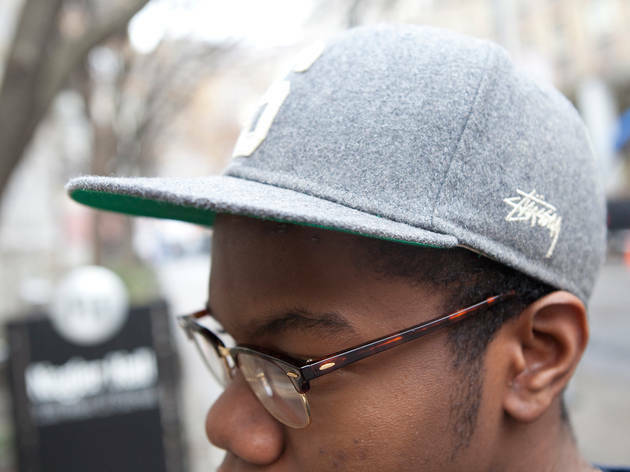 Photograph: Jessica LinChimaobi Anakwenze, 18, advertising and marketing communication major at the Fashion Institute of Technology, ChelseaStudious-looking Ray-Ban glasses and a felt St&uuml;ssy (stussy.com) hat from Urban Outfitters provide the finishing touches. 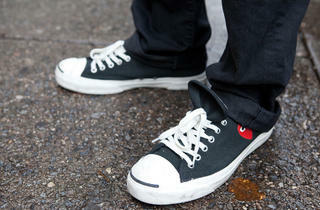 Photograph: Jessica LinChimaobi Anakwenze, 18, advertising and marketing communication major at the Fashion Institute of Technology, ChelseaAnakwenze removed the laces from his Lacoste (lacoste.com) sneakers, purchased at Finish Line (locations throughout the city; visit finishline.com), for a relaxed feel. 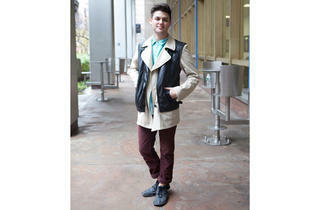 Photograph: Jessica LinJeffrey Bolt, 18, fashion design major at the Fashion Institute of Technology, Chelsea&ldquo;Usually a trench coat will have leather detailing, but I like that he thought of putting a leather vest over a trench coat,&rdquo; says Levin, who was impressed by the illusion Bolt created in layering a pleather vest from Urban Outfitters over a Zara jacket. &ldquo;I&rsquo;m actually going to steal that from him because that&rsquo;s really good.&rdquo; A thrifted button-up shirt from Beacon&rsquo;s Closet that he dyed himself lends a vibrant splash. 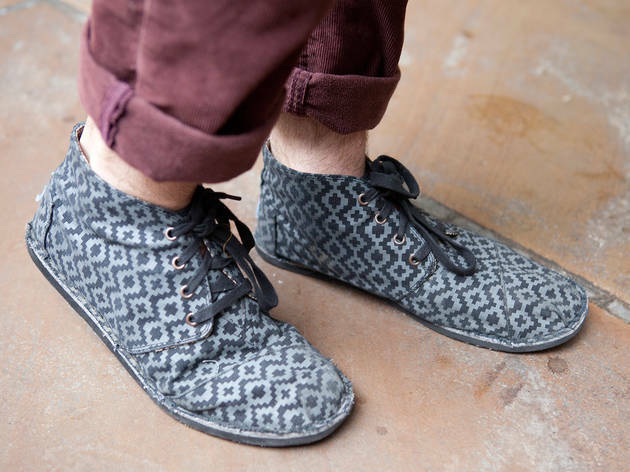 Photograph: Jessica LinJeffrey Bolt, 18, fashion design major at the Fashion Institute of Technology, Chelsea&ldquo;I didn&rsquo;t realize Toms (toms.com) made shoes like these,&rdquo; marvels Levin of Bolt&rsquo;s patterned desert boots. 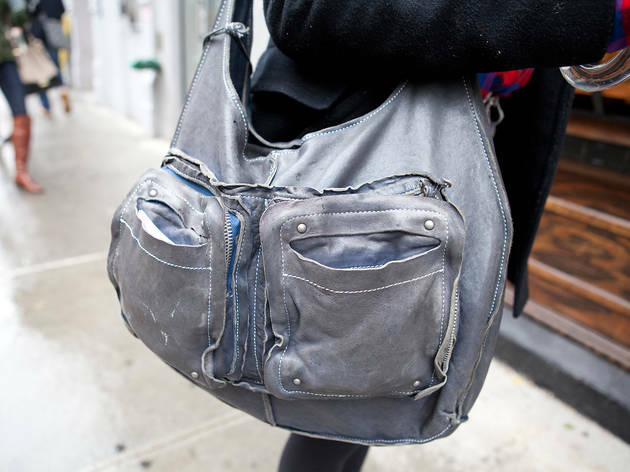 Photograph: Jessica LinAlexis Bailoni, 18, fashion merchandising management at the Fashion Institute of Technology, Chelsea Bailoni slings a leather purse that belonged to her grandmother over her shoulder. 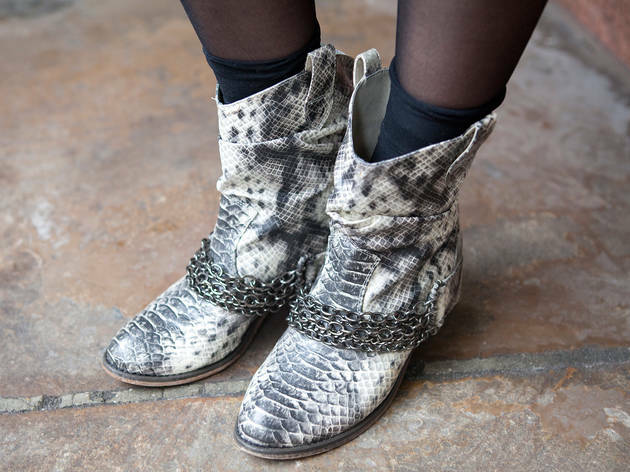 Photograph: Jessica LinAlexis Bailoni, 18, fashion merchandising management at the Fashion Institute of Technology, Chelsea A snakeskin print and chain-link detailing give these Sh&iuml; by Journeys (journeys.com/shi) cowboy boots an unexpected twist. 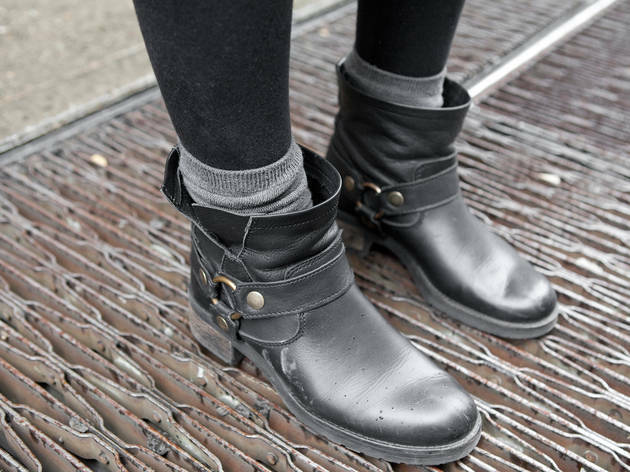 Photograph: Jessica LinClarisse Rassi, 26, fashion design major at the Fashion Institute of Technology, Midtown WestRassi rocks the military trend with Zara army-print skinny jeans. &ldquo;The reason why it works is that she kept everything else relatively neutral, aside from the shoes,&rdquo; explains Levin. 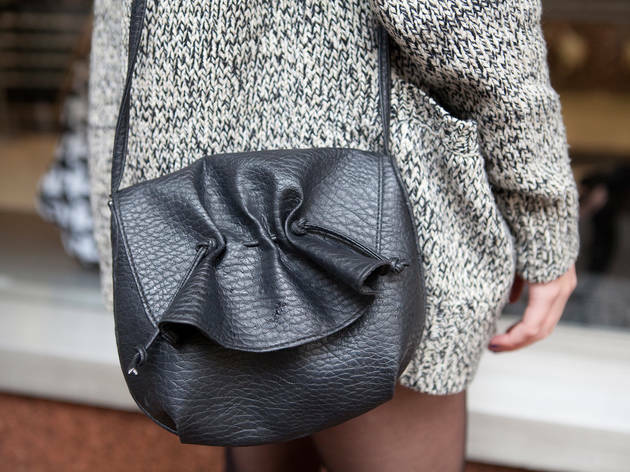 To wit, her H&amp;M bomber jacket, Calvin Klein sweater and leather bag purchased on a trip to Italy are in complementary shades of black, brown and cream. 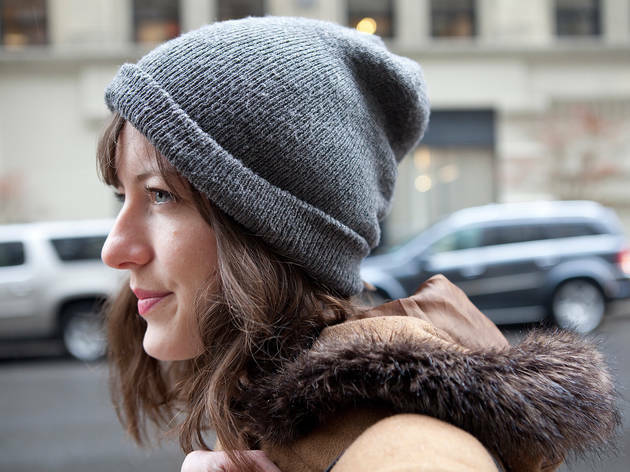 Photograph: Jessica LinClarisse Rassi, 26, fashion design major at the Fashion Institute of Technology, Midtown West&ldquo;College students are always wearing headphones when they&rsquo;re walking to class and hers are really cool,&rdquo; says Levin. 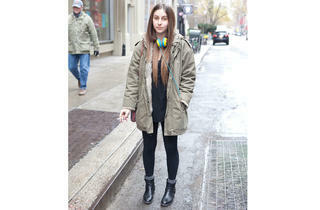 Rassi agrees that her Skullcandy (skullcandy.com) headphones are a must-have accessory while commuting. 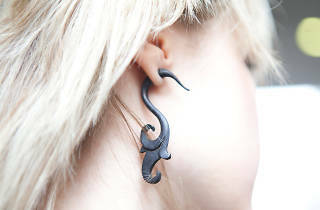 &ldquo;They are amazing when you want to go into your zone,&rdquo; she enthuses. 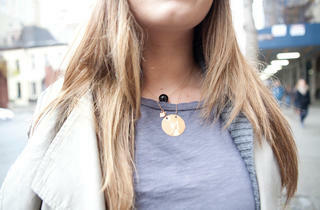 The bird necklace is something Rassi designed back in her native Brazil. 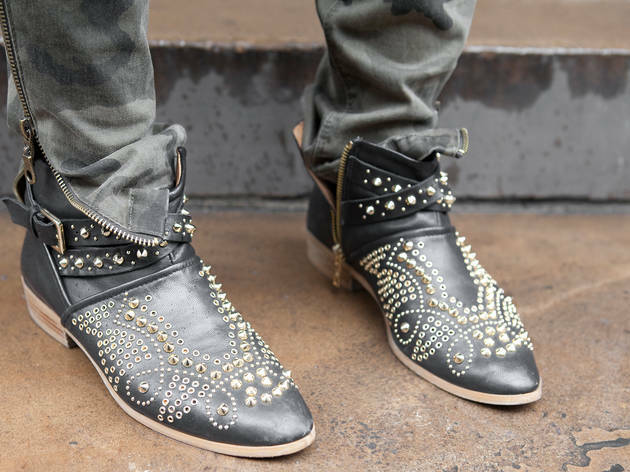 Photograph: Jessica LinClarisse Rassi, 26, fashion design major at the Fashion Institute of Technology, Midtown West These Zara shoes&mdash;a gift from Rassi&rsquo;s mother&mdash;are a convincing knockoff of Chloe&rsquo;s studded leather ankle boots. 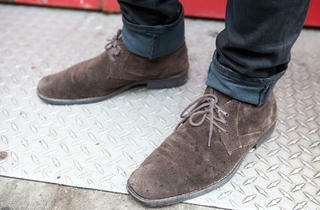 &ldquo;Those are really the highlight of the look,&rdquo; declares Levin.